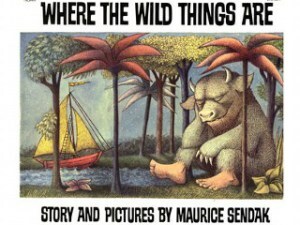 Where the Wild Things Are (Maurice Sendak) and The Family Book (Todd Parr) were the two books at battle today. The children chose to read The Family Book first. The Family Book has a simplistic cover with multicolored people popping out of a tree. Then, the book follows the basic recipe of 4 page spreads each depicting opposite family situations such as “Some families live near each other” opposite of “Some families live far from each other”. This is followed by a double page spread, talking about something that all families share, such as “All families like to hug each other”. Parr’s book is very tolerant for average children’s books, depicting gay families, mixed marriages, and single parents. The page which explained “Some families have two moms or two dads” drew lowered eyebrows and confused looks from the 2nd graders, with some explaining ‘What? How?’ Other reactions included laughter on the page which said ‘Some families look like their pets’, silence on the double spread ‘All families are sad when they lose someone they love.’, and howling on the page ‘Some families like to be noisy’ with an illustration of a family of dogs all howling at the moon with drawn out letters of ‘AAAWOOO’. Where the Wild Things Are is full of Sendak’s far more detailed illustrations, its cover depicts a smiling, sleeping monster and a boat, sailing on the river near him. Generally, it has an atmosphere of serenity, despite the fact that there are monsters. The illustrations grow to eventually fill the page as the protagonist, a little boy, leaves his bedroom where he is punished without supper by his mother for making trouble and enters his world of wild things – where he is the King of all Wild Things and starts the wild rumpus. This rumpus consist of the boy and monsters he meets playing for three double spreads. At the end, he leaves the monsters who cry ‘Oh, please don’t go – we’ll eat you up – we love you so!’ and returns home to a still hot supper his mother left him in his room. The children were very interested in the mixed monsters, some with duck feet, bear claws, and long auburn hair. They debated about whether the costume of the boy was that of a fox or a wolf, and watched in wonder as the boy’s room transformed into a forest. The ending where he returns home seemed a little disappointing to the children who had no comment and looked a little book as I said the end and closed the book. Between the books, Parr’s seemed more interactive when read in a group, often encouraging laughter, while Sendak’s forced the children to watch the illustrations far more carefully for details and text-less changes. Regardless of the actual effect on the children regarding topics of families and disagreements, Parr’s book succeeded in opening a more friendly platform for discussion, while Sendak’s illustrations may force a more singular contemplation of these issues.